1. Add olive oil to medium skillet over medium heat. Add onion and mushrooms and saute, stirring occasionally, until softened, about 5 minutes. Add garlic and cook for another minute, stirring occasionally. 2. Crack eggs into small bowl and beat with a whisk or fork. Pour over veggies. Add the black beans, salt, and pepper. 3. Stir constantly until eggs are cooked through (about 1 minute). Taste and add salt and pepper as needed. 4. 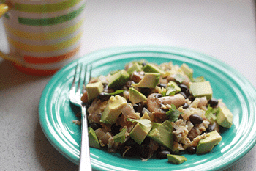 Scoop onto plate(s) and top with diced avocado and cilantro.